Very nice. The vases are gorgeous! Great job and I love all the blue. Thanks for sharing. Willow Ware blue and white with orange is a classy look. I love to use my Currier and Ives blue and white dishes for Thanksgiving dinner. You commented on my post about the handwritten invitation. I am with you...I still think they should teach cursive writing in school. My mother-in-law always wrote letters to my kids but I had to read them the letters because they can barely read cursive. Older folks had beautiful penmanship. Everything is so pretty! You have some lovely blue and whites! Such beautiful pieces!! They're just so elegant! 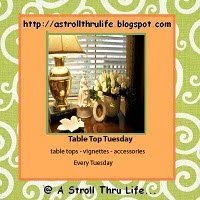 I'm happy to be your newest follower of your delightful blog and would love to have you as a friend at FrouFrou Decor! I would also like to invite you to link up your sweet creations to my weekly Fabulous Friday Finds party! Hope to see you there!